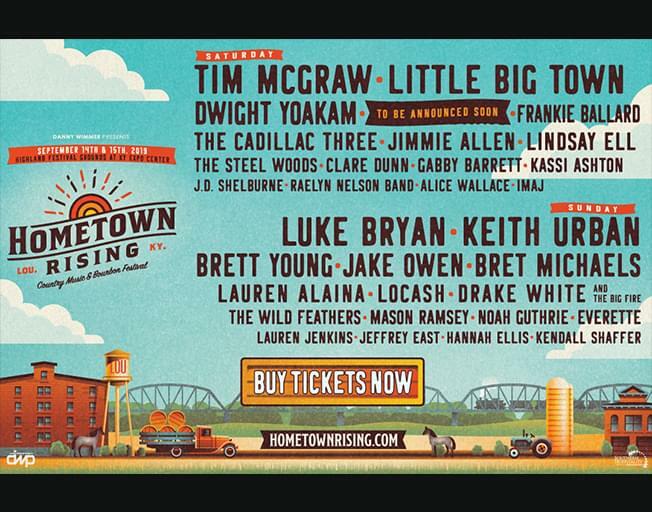 Win Tickets to Hometown Rising Festival with Luke Bryan, Keith Urban & More! B104 wants to send you to the Hometown Rising Country Music and Bourbon Festival in Louisville Kentucky featuring top acts such including Luke Bryan, Tim McGraw, and Keith Urban! The festival will be September 14th and 15th and you can win tickets as a B104 Insider. To win, REGISTER HERE by Sunday (April 21st) at 11:59 pm. Other performers include Little Big Town, Jake Owen, Jimmie Allen, Lindsay Ell, Brett Young, Lauren Alaina and more! In total, there will be more than 30 bands play on 3 stages PLUS the legendary Big Bourbon Bar! You can get more details about the festival including ticket info here. If you’re not a member of B104 Insider Rewards, sign up for free today and take advantage of the benefits! Don’t miss this chance to go to the Hometown Rising Country Music and Bourbon Festival in Louisville Kentucky with Bloomington-Normal’s #1 Country, B104!